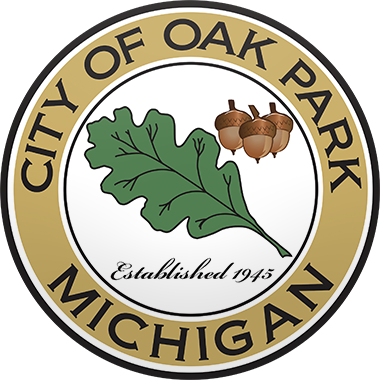 Welcome to the City of Oak Park. We are an inner ring, suburban community of Detroit with 30,000 residents. The City boasts an A+ Positive bond rating from Standard and Poor’s and is financially stable. We pride ourselves on the richness of our cultural diversity and our safe, secure neighborhoods. We actively encourage residential and business growth. We are business-minded and family-centered. 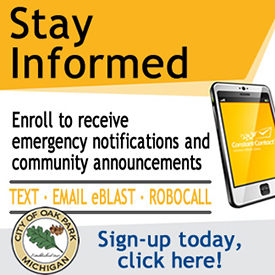 The City offices are located at 14000 Oak Park Blvd, Oak Park, MIch., and are open Monday-Thursday from 8 a.m. to 5 p.m., and every other Friday from 8 a.m. to 4 p.m. For assistance, use our Citizen's Action Center or call (248) 691-7400. You can also follow us on Facebook, Twitter and YouTube.